Click here to view the new ewYOUTUBE video! Eryck Webb Graphics is proud to launch a new series of original content to its YouTube channel! 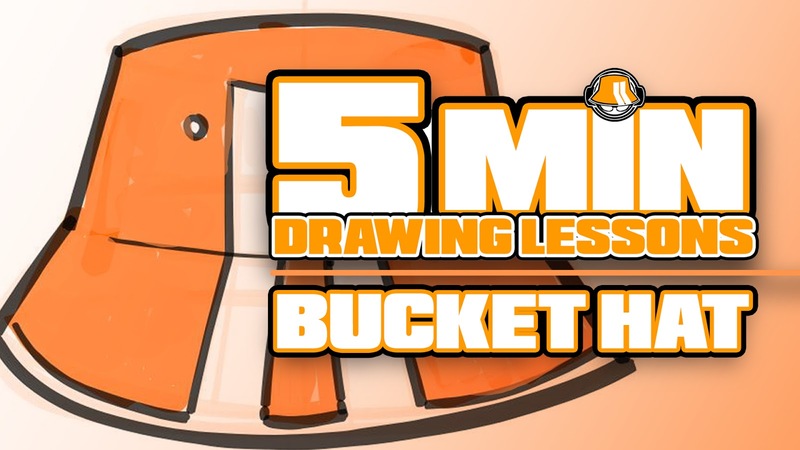 Introducing 5 Min Drawing Lessons. Each video will be a simple, easy to follow break down from start to finish of how Eryck Webb approaches drawing different subject matter. Some will be very simple. Some will be challenging. For this first installment, it seemed appropriate to kick it off with the first subject being a bucket hat. Come out and study more drawing by Eryck Webb weekly on Twitch over at twitch.tv/eryckwebb ! Subscribe to the ewYOUTUBE channel to be notified when new videos get posted! I will be attempting to do a new one of these about weekly! Interested in more process? Check out the process section of this blog site and also other process videos on ewYOUTUBE! Thank you for watching! Keep drawing! I'd be interested to hear your positive and critical comments on this new series and its first installment in the comments below or on the video's page. 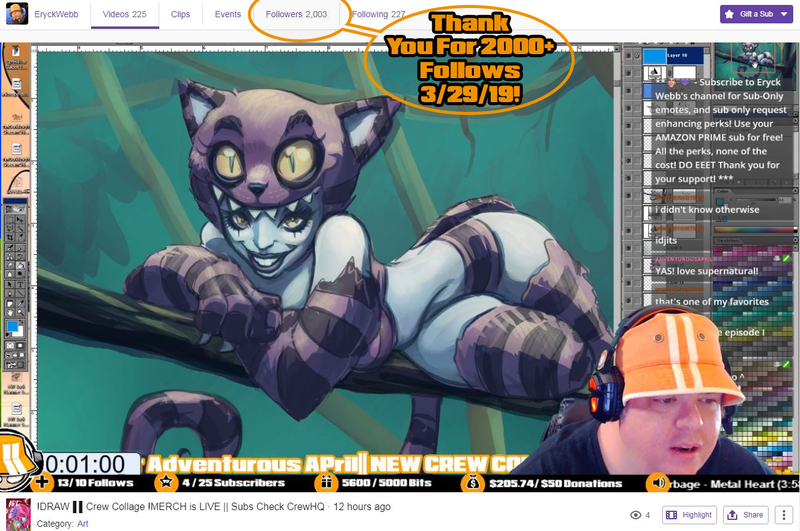 Thank you to all the CRew and those who are new for all the follows that got us past our 2000 follow goal! It seems like only a few months ago I was trying for that first 1000. There's been a lot of new faces lately and its been really great meeting all of you! I am constantly saying that planet Twitch gets a little smaller every day. As it does, the communities blend and new friendships and chances for creative growth are formed. I feel like this threshold took a while to cross but we finally popped that bubble in the last few minutes of the last stream of this week. Big big thanks to all who helped bring over their communities to make it possible, and to the new faces I've enjoyed meeting and drawing for this week. 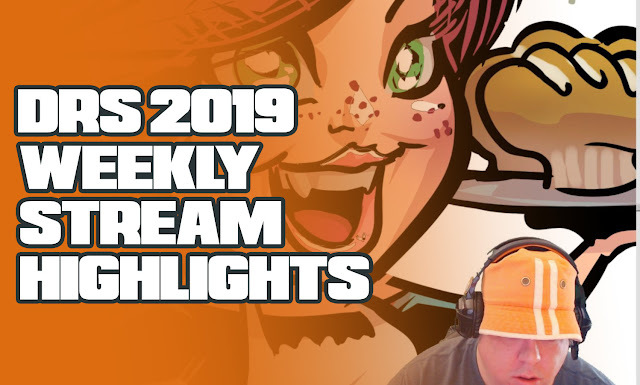 Onward and upward as 2019 promises to continue to be one of the best stream years yet! 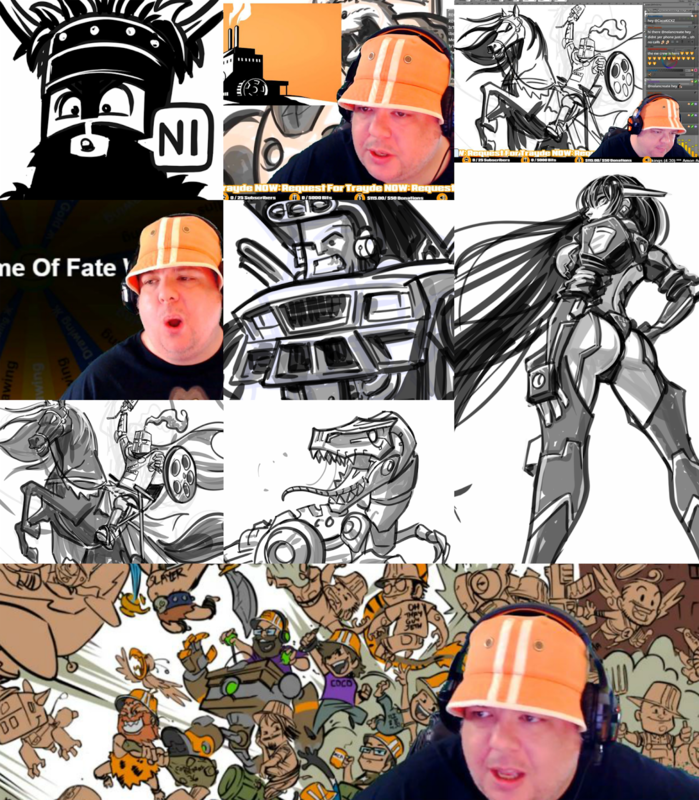 Hope to see you at the next stream, live, M-F on Twitch!! ewSHOP! - New ewSPRING 2019 Design is Live In The Shop! Happy to announce the new Spring design for 2019 is live in the ewSHOP! 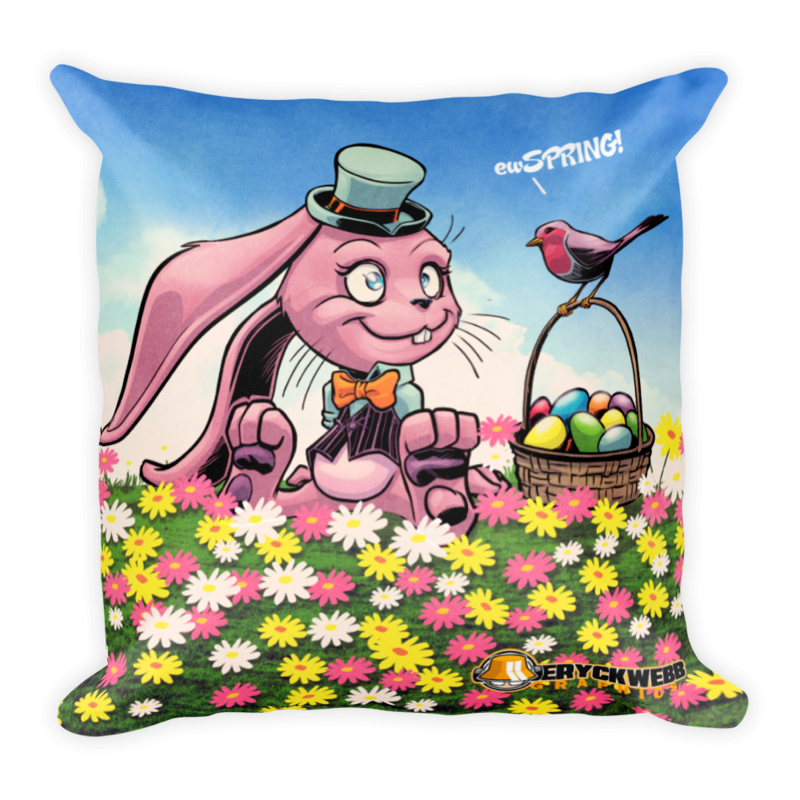 Enjoy this fun original artwork by Eryck Webb featuring lots of fresh blooming flowers, green grass, blue skies, and a happy easter bunny and robin hanging out enjoying the day. This artwork is available as a decorative design on mugs, pillows, tees, posters and digital downloads! This is a limited time item only lasting till about mid April, so be sure to spring into action and grab an original ewSPRING 2019 product to have and to own before it hops away! Thank you to the CRew and all of Yew for a really really cool week. I feel like I hit some kind of stryde this week with you guys and its been great. Thank you for coming out, enjoying the upgrades and making drawing requests. Thank you for all the sauce you guys throw at me and all the draws I get to whip out for you. When the ewHOTROD art is done it will be available for purchase as a digital download like the exclusive wallpapers, and available as a print in the shop as well. Same goes for the crew picture. Thank you everyone for making this drawing dram a reality. From me, Kiwi and Wally and the Hat, have a safe night, safe weekend and we'll see you next week for more! Look for posts on ewTWITTER over the weekend and the schedule for next week post Sunday. Thanks for a great week of drawing, inking and coloring requests for the TRew believers! Its not over yet, but I wanted to show off a few of the pieces that got us over that hump this week. Thanks for all the support, fandom and encouragement. I continue to learn new things, push my drawings in new directions and constantly work to level up. I could not do this drawing dream with out every single member of the CRew and I appreciate all the things they make possible for me, Kristina and our life. Just felt compelled to show off some of these awesome requests from Wednesday, and invite you to come out see this stuff happen first hand, M-F on twitch.tv/eryckwebb - look forward to having you! 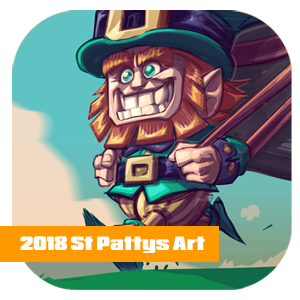 New in the ewSHOP: 2019 St Pattys Hires Wallpaper Art! An EW Original! EWG is happy to present a new original digital art piece available for digital download! As seen on Erycks own desktop background, this new artwork features a speedy Leprechaun making haste with his pot of gold! This artwork is the first of 2019 in a series of original monthly art from Eryck Webb! Download the 11x17 300dpi horizontal art by heading to the ewSHOP! Pay securely via PayPal balance or credit card ( through paypal ) over at the PayHip vendor. A link to download your item is provided via checkout. Enjoy!! Please comment below or on any social posts about this item let EWG know what you think of this digital artwork purchase, and what you'd like to see for the future! Head to the ewSHOP and grab this Leprechaun before he runs off RIGHT NOW! ewSHOP Updated! Best Of Request Vol 2 Digital Edition Now Available! I'm happy to announce the ewSHOP has been cleaned up for 2019 and a new addition has been made available to purchase! 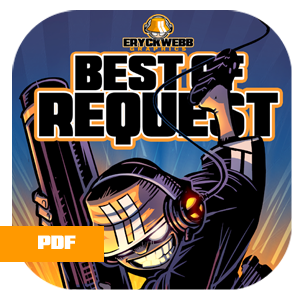 Best Of Request Volume 2 is now available as a Digital Edition!! Use a credit card or PayPal through the PayHip vendor its available through, and enjoy the 250 pages of drawings, commentary and stream yearbook content on your favorite phone or mobile device!! Look for Volume 3 Print PreOrder to go live Spring 2019! Happy to update folks waiting on my new book, Best Of Request Volume 3! The total page count has been established, thought its subject to change. All the art that's going to be in the book has been laid out, and the page count currently including extra content after the art is about 210 pages. After finishing inserting the art this morning, I started to then scroll through the book and button up any missed border lines or spacing issues and I have to say, I am so proud of all the art in this book. Spread after spread is just saturated with sauce ( digital ink and shades ) and there's such a huge variety. I think volume 3 represents the boldest year of streaming and drawing for folks on Twitch yet. 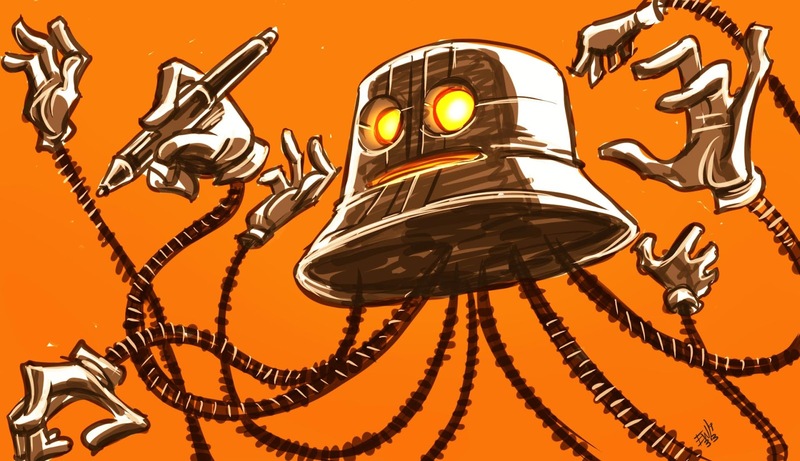 There's tons of experimentation with new styles, bold attempts in new directions and leveling up across the board on overall execution of the drawing requests. I think fans are going to love it. I'm really really happy with this collection. Next up is locking down the type copy and inserting it, as well as some extra curricular content in the back. There's also a cool intro that I will be finishing for the front as well. I'm officially calling it 75% done. Not a ton left to do. 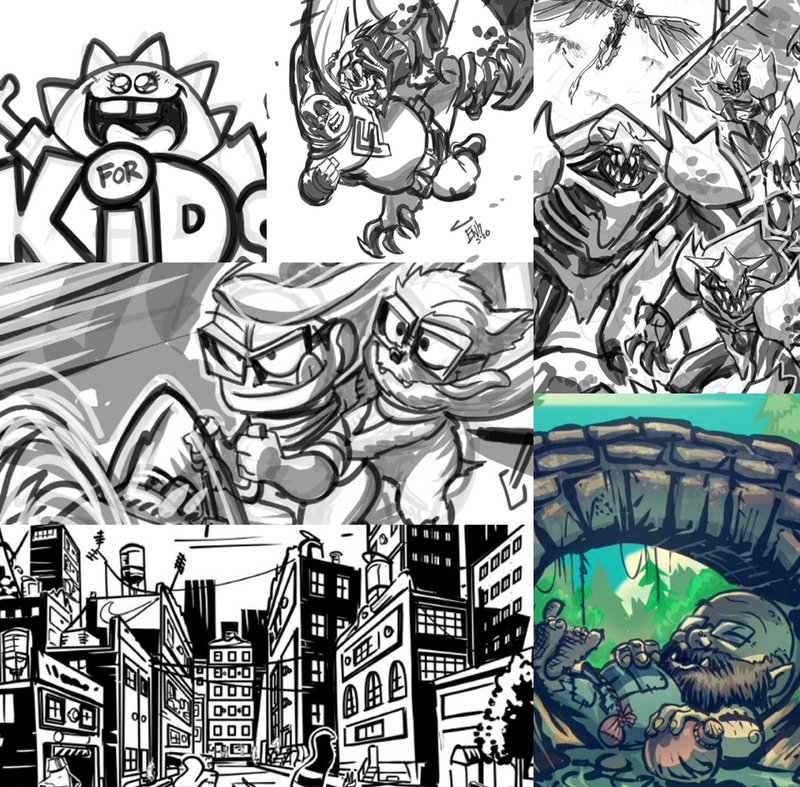 I might also celebrate the completion of production on the book by illustrating the cover live on Twitch soon! Please look forward to it! The entire book is built. The end of book content and the page count will be 214 interior pages. The next steps will be proofreading, editing, refining and any final tweaks and then to design and create the cover and get it to the printer! Thanks to all the crew for staying trew! As I've talked about on stream this week, I want to minimize the number of outside projects I have to juggle outside of the stream and the work it generates. So in an effort to do that, I am continuing to not take on any outside-of-stream work, or extra inhouse projects like designing new merch or original art to sell. Right now, I have more work than I can handle with drawing requests and upgraded commissions for folks on stream. I also am trying to fit production on the new book, Best of Request Volume 3 to get it out this spring, and a family obligation that I probably should not have taken on but none the less must finish. I'm hoping to have the family project done in the coming week. Anyways back to my point. The previous DRS 2019 highlight video edits were fun but very time consuming and constantly riddled with copyright issues from youtube in terms of music i used in the videos and dealing with them being blocked after having spent hours making them, a good hour or two saving it out and a good hour or two more uploading and waiting for them to be processed. To continue my efforts for more focus on just the stream work, I am not making those full edits anymore. Instead I think a daily highlight or a couple highlights from the week cropped out of a given stream and exported to YouTube should work just as well. Important stream goof or discussion moments, and especially requests that I deem worthy to stick up on youtube. At the end of the week I'll post like I am now, and feature those highlights in one post. This will take much less time and still serve to keep new content on ewYouTube for general viewing! I also generally plan to upload sketchbook and other free time art recordings as well as process videos as bonuses every now and then.